Since the onset of bedbugs in the late 90’s, we’ve come to understand that bedbug infestations are completely avoidable. No, we’re not saying you won’t get them, because everyone is at risk. What we are saying is, bedbugs don’t have to grow into infestations if you put a little prevention in place. It starts with  learning risks and how to recognize the signs. Once you know these things you can be proactive in prevention! KiltronX is a company that thought this out and prepared a powerful, yet effective product line to end bedbugs before they can take hold. From what you read online, you’d think that bedbugs are impossible to deal with. Well, it isn’t so if you know what you’re doing that is. We give you power to control and make it easy and affordable. Having a coordinated bedbug control system in place eliminates the worry of bed bugs taking over. We know that pesticides are not the answer to bedbugs. Most pesticides used today, are at best moderately effective at controlling these pests. Sure, they may kill a bug if you drown it with spray, but most bedbugs “hide” where you can’t always see them. And who wants their home saturated with toxic chemicals anyway? “if you already have an infestation”, determine the extent of your infestation. We are here to put an end to bedbugs without breaking the bank. 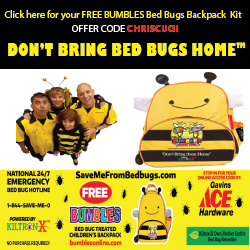 Order our  KiltronX Live Free Bedbug Barrier Systems Emergency Response Kit and get to work. You want to make sure you apply KiltronX products in all areas. Most of the time bedbugs will be found in areas where they can access a meal, your bed. But they are often found in coaches and easy chairs. They don’t fly or jump so they need to crawl to your when you are resting for long periods of time. Typically, an infestation will begin in one room and spread to other rooms of the home as people take items that may be infested from one room to another. So be mindful of what you remove from the infested room so you don’t spread them further. Also, if you live in a dwelling with shared walls you need to talk to your neighbors and coordinate a complete elimination protocol together. Don’t go throwing away all your furniture! It’s not necessary and most everything is treatable. (Unless it’s very old, has lots of rips, stains, tears and you wanted to replace it anyway). And don’t forget to mark it “Bed Bug Infested“, so it isn’t tempting for an unsuspected trash shopper. And please, don’t donate infested items to your local thrift store! Bedbugs are normally located on the mattress and box spring piping and edges, but can also be on the headboard and frame if you have one. 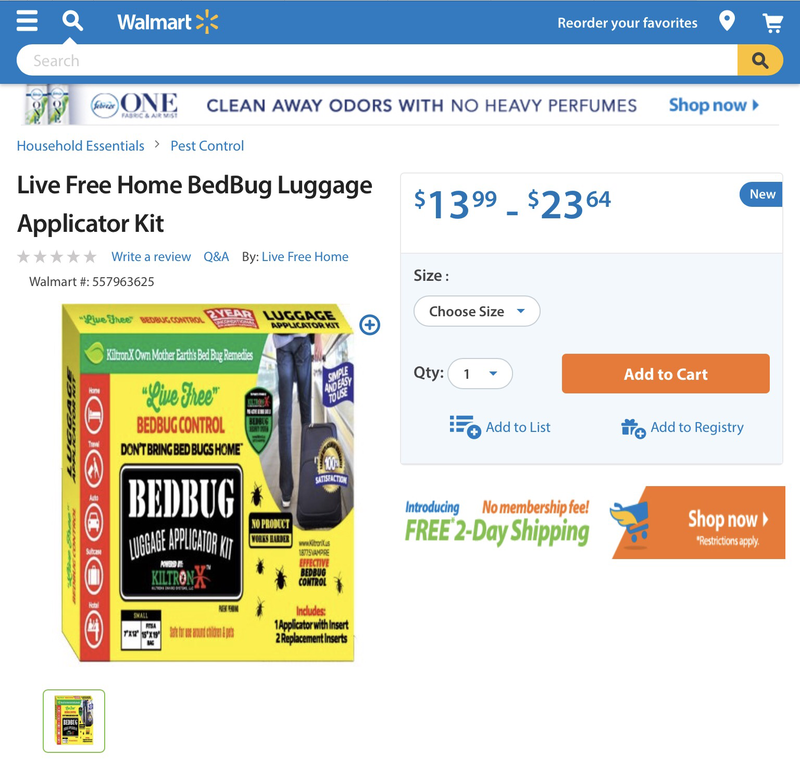 The KiltronX Bedbug Control System is the first, and only one of its kind, complete bedbug solution that offers protection for the entire room. Our product consists of non-woven textiles infuse with an organic compound called KiltreX Powder that actively kills bedbugs. When a bed bug crawls across the protective barrier and comes in contact with KiltreX Powder, the powder works by pulling the moisture out the exoskeleton of the bug. Similar usage in the organic farming industry, KiltreX Powder can be safely used around humans and pets. First, apply Live Free Kilspray and KiltreX Powder to infect areas and allow to dry. For best results, apply  KiltronX Mattress Wrap and Topper Sheet to your bed. This creates a “barrier” to protect you and kill bedbugs. Apply Leg Booties to the legs of your bed-frame and KilTape to headboard. Note: Take furniture apart – remove drawers and cushions and inspect and treat every nook and cranny. Pat attention to each welt, button and fold in upholstered furniture. You man wish to discard low-value, stuffed furniture that is infested and too difficult to treat, After spraying, return each article of furniture to the part of the room that have been treated. Do not reintroduce any furniture of other items to the treated room until they have been thoroughly clean, inspected or treated. 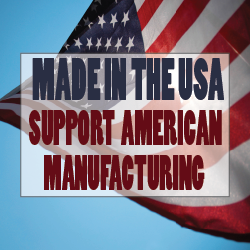 All our product can be found on our website, Amazon, Walmart for under $100. KiltronX products work 24/7/365 and helps control bed bugs – Guaranteed for up to two years! No other product gives you the peace of mind and guarantee that KiltronX does. He spent months fighting bedbugs with sprays and fumigation, but the bedbug infestation at Lucas da Silva’s house only got worse. At the peak of its severity, da Silva could flip over his mattress in the middle of the day, and bedbugs would appear everywhere, crawling around as if they owned the joint. Exterminators were expensive and none could guarantee that the appleseed-size verminwould disappear forever, said da Silva. In frenzied desperation, da Silva, 23, of Orlando, Fla., took his Brazilian grandmother’s advice and turned to kerosene. She told her grandson that Brazilians use it to combat all sorts of vermin. He doused his home. He covered bookcases, the upholstery, tables and chairs with the combustible hydrocarbon liquid. But the kerosene offered only a week of relief until the bugs came back in droves. After nearly two years of fighting the vermin, he and his family eventually threw away their mattresses and beds, and moved into a new home. Still, even though da Silva now lives free of the parasites, the experience still haunts him. Da Silva might be pleased to learn that his feelings are not that unusual, according to a new study. Researchers found that bedbug infestation, and often the media frenzy surrounding the vermin, may increase the risk of mental health problems and exacerbate pre-existing psychiatric conditions. Ten people, ranging in age from 21 to 75, participated in the study, but the researchers presented a detailed review of six of the 10 cases at the American Psychiatric Associationmeeting in Honolulu. After a bedbug infestation, some participants experienced anxiety, depression, controlled bipolar disorder and monosymptomatic delusional disorder in which one imagines that bugs are crawling all over the skin. For other participants, it didn’t take an actual infestation to trigger anxiety and symptoms of paranoia. Rieder said some of them exhibited tactile hallucinations. Even though they did not have a history of an infestation nor a history of psychosis, the participants were convinced that bedbugs were crawling on their skin. Rieder said the swirling media coverage surrounding the vermin may play a part in the paranoia that surrounds this condition. “If you look at the media on a global basis, bedbugs are all over the place, and the incidence in the media, in newspapers, magazines, TV reports, has been going up steadily since the year 2001, so there may be some media-driven frenzy,” Rieder told MedPage Today. Researchers said it’s unclear why a bedbug infestation threatens the mental health of some more than others, but they hope to research the topic further, as bedbugs are not going away. Nelson said that he and other exterminators often act as stand-in psychologists, reassuring the customers that they will help them get through this mentally exhausting ordeal. As for da Silva, he said he empathized and understood why bedbugs may wreak havoc on a person’s psyche. While da Silva didn’t need psychiatric help to manage his bedbug storm, the experience is not over for him. Bedbugs, those creepy crawly pests that embed themselves into mattresses and furniture, are a problem in big cities across the country. The bugs have managed to find their way to smaller cities in the North Country. Watertown is now dealing with the pests and the stigma that comes with them. Back in September, a friend told me she was dealing with a serious bed bug issue. Her name is Kris Rusho and I gave her a call a few weeks ago to get the whole story. “I think what I’ve learned from this is that bedbugs can be in the nicest of houses,” she said. Bed bugs can lead to loss of sleep and other mental issues that are as bad as the bites. They also hitch rides on clothing and furniture which allows them to spread to new homes. That is why they are a public health issue. Steve Jennings, a member of the Watertown City Council who works with the county public health department, said his office, along with community nonprofits in Watertown, are getting calls from people asking for help. Jennings said the demand was so high, his office organized an education forum on the bugs. He said the big takeaway was this: “Normal pesticides you’d buy at a drug store do not work with bed bugs. They are resistant. It really needs to be professionally abated,” he said. But hiring a professional exterminator can be costly. A few months ago, one fed-up resident in a downtown apartment tried to concoct a homemade pesticide bomb. He ended up starting a fire in his apartment. Neighbors of Watertown, a group that owns six apartment buildings in the city, has already spent more than $20,000 trying to get rid of the bugs. Jennings said everyone needs to work together on this. 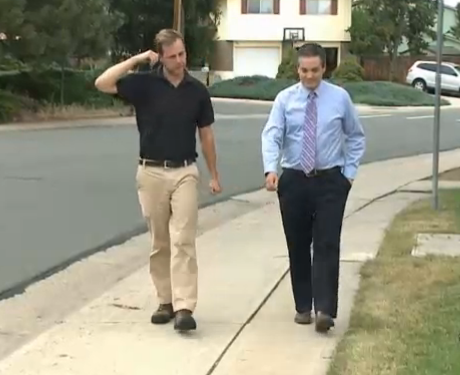 “The tenants really have to do their part in controlling it. Don’t bring this stuff home. When you see it, take care of it,” he said. At the Impossible Dream thrift store, shoppers browse through racks of clothing, used couches and coffee tables. The staff have to be extra cautions about what they allow in the store. James Williams oversees furniture donations. Williams showed me a binder with a laminated fact sheet. 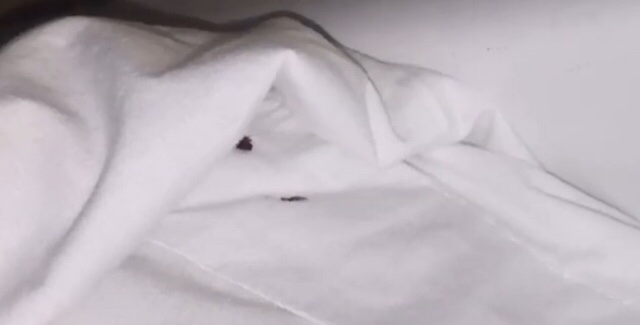 It details how to spot bedbugs. He pulled out a tiny flashlight and leaned over a couch. 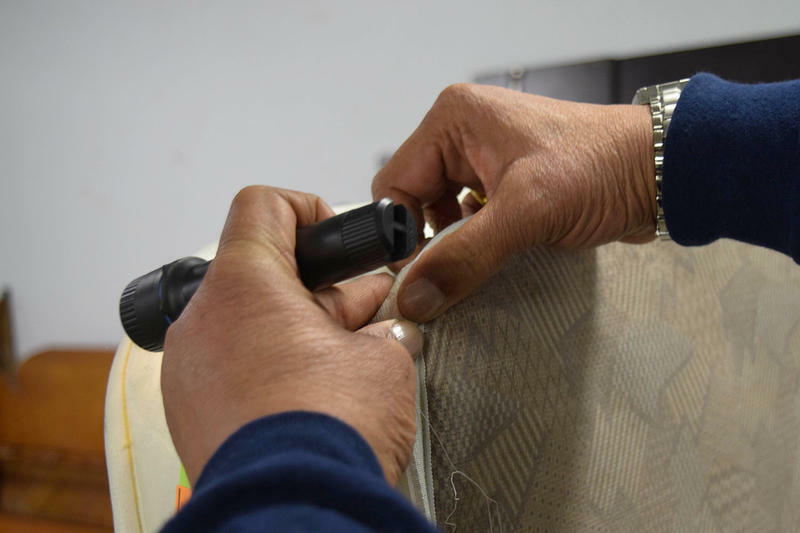 “Before we even accept it, before we even take it off a customer’s truck we look at it thoroughly, we look at the seams like this, we pull up the cushions, we look in the corners. We’re looking for bedbugs,” he said. The store hasn’t had any encounters with the critters. That is really important to the store, he said, since the last thing they want to do is pass on the problem. Watertown has been working hard to make their downtown an attractive place to live. I asked people if this bedbug issue is thwarting that effort. Kris Rusho said the bedbugs are not just in downtown apartments. She may be the unluckiest renter in Toronto. Kathleen says bedbugs have forced her to move 11 times in the past six years. The 45-year-old doesn’t even want her last name used because she says she’s already lost one job over the tiny critters. “I was a normal person, I had a job and a nice apartment and this has completely broken my life,” she said. She claims she first picked them up in 2010 after volunteering at a community centre in Regent Park. Kathleen says she lost her job because she “made the mistake” of coming clean with her employers. “I literally walked away with nothing but my health card in some cases, just trying to completely rid myself of them, only to end up in other buildings that were also infested,” she explained. That’s why she spent Friday with placards outside City Hall, demanding more action in the battle against bedbugs. She even had a friend — a private landlord from St. Catharines — dress up like a brown bedbug called Badness the Bedbug, which attracted curious looks from passersby. 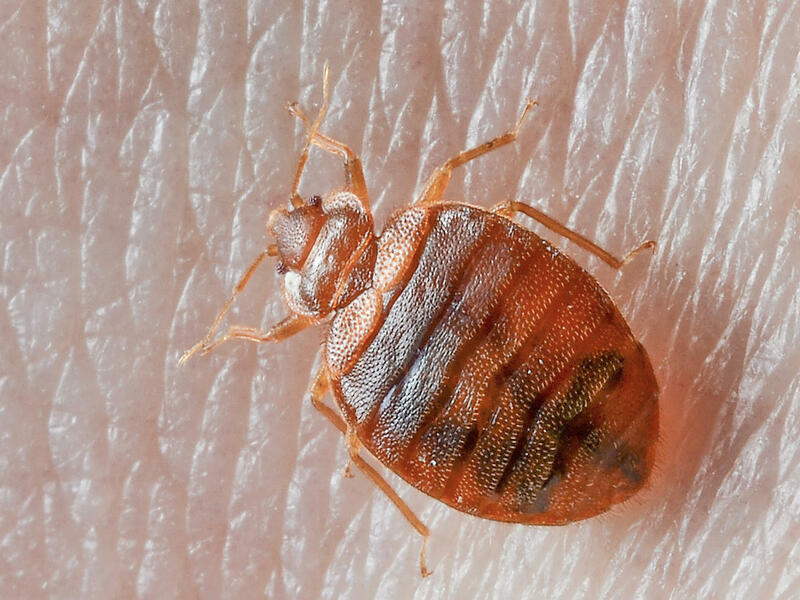 The city’s website says if a landlord refuses to help with bedbugs, the tenant can contact a legal clinic, the landlord and tenant board, or Toronto Public Health.